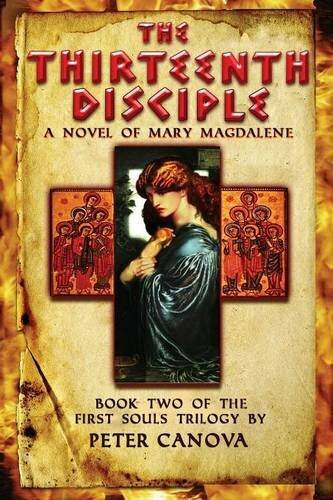 In “The Thirteenth Disciple,” author Peter Canova provides an excellent detailed fictional account of Mary Magdalene and lost mystical teachings with a modern twist. Mary Magdalene’s story talks of how individuals, no matter what their belief, have forgotten the true teachings of God and entered life with greed, anger and condemnations of those who did not think the way they did. Each reader will develop his or her own perception of the views presented in this book. The information provided is based on historical accounts of the Bible, along with information the author uses to fill in the gaps. In A.D.12, Mary of Magdala was a young, out-spoken child about her beliefs on God and the hypocrisy of others. Many thought she had premonitions and was a witch. When she could handle no more of this behavior by them and her father, she ran away toward Jerusalem. Through the course of her journey in search of truth and the real meaning of God, Mary was violated by a Roman soldier and sold in Babylon to a whoremaster. During the same time, many others could see the negative events occurring due to their own actions. It was thought that due to the shift of people’s attitudes toward, freed, ignorance and false belief, the world they knew would be no more. The Grand Council of the Mystery Schools met and decided that, based on a scroll that pointed to a woman as the focus, they would fight the negatives with truth. Canova vividly describes events that occurred over the years that pitted friend against friend, religions against religions, and the crucifixion’s impact on all who roamed the earth. He throws in a modern twist to history which will have readers question history and what they grew up believing. The ending will surprise everyone. At 490 pages, my initial thought was, “How would I ever get through this?” Once I started reading, however, I couldn’t put it down. “The Thirteenth Disciple” is very well written, easy to read, and very thought provoking. Peter Canova captures the attention the reader from the first page and keeps their attention throughout with different thoughts and events.